The Lair of Filth: Two Way Tape Review - Summon - Aesthetics of Demise + Absolvtion - Obscure Catharsis. Summon (Portugal) - Aesthetics of Demise. Summon’s music goes beyond standard ‘Sepulchral Death Metal,’ having an edge to it that seethes with a down tempo lurking menace. The production is suitably murky without being too muffled and the harsh, seething vocal also plays its part in the background, adding a further depth to the overall ominous traits of this slow motion trip into the depths of N’s twisted psyche. ‘Aesthetics of Demise’ features five tracks of underground Death-Doom and experimentation but it’s on the closing track, ‘Cult of Deep Realms’ that Summon really let loose with regards to their experimental side. 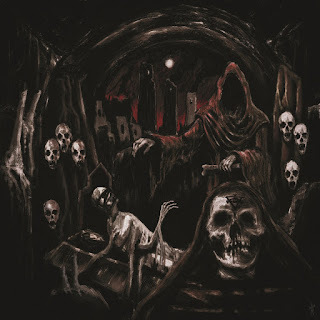 The instrumental track lasts close to six minutes and features all manner of sounds and effects which bring you on an excursion to some dank and dark demonic prison – no guitar work or vocals, just dripping water, hostile background chants/moans and effects drag you slowly into this twisted and evil world created by Summon. This is most definitely a demo worth getting and yet another piece of underground genius delivered by Iron Bonehead Productions. Track four, ‘Sacred Pestilence,’ is available to stream below and serves as a good indication of what to expect from the rest of the demo. Most definitely a band to keep in your sights and a very strong demo 8/10. 05 - Cult of Deep Realms. 'Aesthetics of Demise' by Summon is currently available on cassette here from Iron Bonehead Productions and also available on digital formats here. Absolvtion is a relative newcomer to the French underground, an underground that’s currently punching well above its weight in terms of quality as the country’s productivity recently has been outstanding with bands like Necroblood, Impure Ziggurat, Cadaveric Fumes, Hexen Holocaust and Autokrator just a few examples from the current French Underground Revolution. 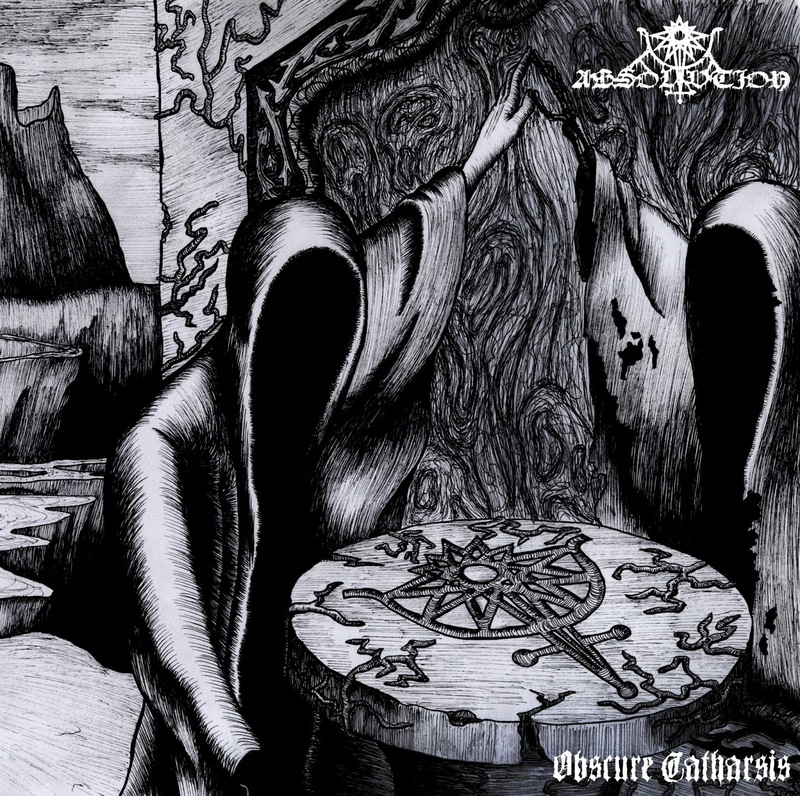 Absolvtion formed in 2014 but it was May 2016 before the band released any music which came in the form of the ‘Obscure Catharsis’ demo which they released independently on digital formats. The first this promising demo received a physical release was in April of this year when French label Atavism Records released a cassette version limited to 300 copies. As with Summon, Absolvtion keep details about membership close to their chest and use initials to identify band members – A. plays bass and performs backing vocals, S. is the drummer, M. is the guitarist and also performs backing vocals and F. is the lead vocalist. Absolvtion describe their music as vindictive, hateful and harmful War Metal. 'Obscure Catharsis' features five tracks across twenty seven minutes so there’s plenty for us to get our teeth stuck into with the stream that’s available below. Opener, ‘From Womb to the Void’ is a short instrumental that serves as an introduction and with its effects and slow pace gives us a taste of what to expect. ‘Hammer of Judgement’ follows with strained guitar tones and hostile vocals combining well during throughout the track to give it quite a daunting and ominous tone, especially during the slower sections towards its conclusion. By and large it’s a mid-pace tempo during ‘Obscure Catharsis’ which is punctuated with several drops into doom territory. Strong riffs feature across the demo’s duration, such as on ‘Revelations from the Wounds,’ during which the band adopts a sound and pace that is occasionally reminiscent of Vassafor. Guitars feature very heavily in the mix, sometimes at the expense of the drums, of which the most audible part is the cymbals, however, this doesn’t detract too much from the overall standard of music to be heard and with enhanced production levels this band is well capable of delivering some very strong music. As a demo, and first release, 'Obscure Catharsis' shows a great degree of promise – it understandably has a rawness to its sound but serves itself extremely well as it leaves an appetite and desire to hear more from the Absolvtion, hopefully in the near future. A very promising demo 7.5/10. 'Obscure Catharsis' by Absolvtion is currently available on cassette here from Atavism Records.